BOSTON -- Their encounter was brief, lasting but 2 or 3 seconds, one coach the victor and the other the vanquished, and very, very little was said. "Good luck," Stan Van Gundy told Doc Rivers as he shook his hand in the narrow hallway behind the interview podium, getting a simple "thanks" in return. Once again, the Celtics had left a favored opponent stunned and more or less speechless. On a night when the new Garden rocked throughout the fourth quarter with chants of "Beat L.A.," the Boston Celtics earned the right -- and earned it with zest -- to go for yet another NBA championship as they defeated the Orlando Magic 96-84 Friday night in Game 6 of the Eastern Conference finals. "Bring back No. 18, OK?" Celtics great Dave Cowens turned and said to owner Wycliffe "Wyc" Grousbeck as he handed him the Eastern Conference championship trophy, the same trophy that Rasheed Wallace later held aloft and let the fans touch as the Celtics exited the court some 10 minutes after the final buzzer. "If you come off the two series they just had, I mean, they beat two very good teams, and they made us look like we weren't very good teams, OK?" Van Gundy said. "Cleveland was upset with the way they played, and we're certainly upset with the way we played. But when you go through two series like that, I think you have to be fair and say a lot of it had to do with them, and they are playing very, very well right now." The closeout game came four nights later than it could have, and Boston emerged from this series with a lot more bumps and bruises than they might have had if they had finished this thing off with a sweep, as it appeared they would after taking the first three games. But out of that adversity emerged a positive, a night when the Celtics discovered that Nate Robinson could indeed be the X factor in the postseason they thought he would be when they acquired him from New York back at the trading deadline. After Rajon Rondo crashed to the hardwood and bruised his tailbone late in a first quarter in which he was once again dominant, Robinson took over the quarterbacking duties to start the second period and was the difference-maker in this game. In 8 minutes and 46 seconds of the second stanza, Robinson made four shots, including two 3-pointers, sank two free throws and had an assist and a steal to spearhead a surge in which the Celtics built their lead as high as 21 points. Orlando got that deficit down to 13 by halftime and came out for the second half trying to maintain that momentum, but Ray Allen drilled two 3-pointers in a span of 38 seconds early in the third, forcing Van Gundy to call a timeout, and Pierce added a dagger of a 3 coming out of that break to get the lead back up to 22 and sink the Magic's spirits. Allen scored 20, Paul Pierce led Boston with 31 while going 4-for-5 from 3-point range, and Rondo scored 14 with six assists in a game the Celtics controlled defensively by refusing to allow the Magic to move the ball with quick passes or get the Celtics caught in mismatches in transition (two things that fueled Orlando's success in Games 4 and 5). The Magic never made a serious run in the fourth, and there were still 14 seconds left to tick off the clock when the Celtics posted an announcement on the video board that tickets for Games 3, 4 and 5 of the NBA Finals -- which will begin Thursday in Los Angeles or Phoenix -- will go on sale Wednesday. No telling yet whether the Celtics will be underdogs in that series, but it'd be hard to justifiably cast them brightly in that light after assessing the quality of their accomplishment over the course of the first three rounds of the playoffs. Three wins in a row to start against Miami, then the same against Orlando. In between, there were the three straight victories to close out the Cavs that may end up going down as the three nights that drove LeBron James out of Cleveland. They are battle-tested, wise, defensively oriented and savvy, and for a majority of them this will not be their first time playing on the NBA's ultimate stage. The biggest question surrounding them will be which Celtics team will show up: The team that started the season 23-5 and the one that closed out the Cavs and Magic in six games, or the team that went adrift in closing the season 27-27 and made cameo appearances in the postseason, too, once in Game 3 against Cleveland and then again in Game 5 against Orlando. I had the Celtics as my preseason pick to emerge from the East, but my belief in them sank from January onward because I judged them on what they were doing, not on what they were plainly capable of doing when money time arrived. "We started out so well, I thought after 28 games you could say we felt like we were the best team in the NBA, and then after that we had injuries, we fell apart, we struggled finding ourselves," Rivers said. "But as a coach, I just believed that I saw what they did and I saw what they had. "And we kept saying, as a staff, 'It's in us.' We just have to find a way to get it back out of us." That mojo came back the way it often does on veteran-laden teams. Rivers sacrificed regular-season success to let his players' brittle bones and bodies heal, and the "real" season commenced in mid-April with Rivers proclaiming that the season should be judged a success because the Celtics had accomplished their No. 1 goal -- going into the playoffs as healthy as they'd been all season. Health problems are again a concern, though. Wallace has back spasms that were so bad he was in obvious discomfort during player introductions. Glen Davis was cleared to play after sustaining a concussion in Game 5, but Marquis Daniels fared worse after getting the same injury, feeling numbness in his feet and hands that Rivers said could keep him sidelined a while. Tony Allen still has a sore foot, and Rondo, who had been having back problems, was clearly slowed by the bang his body took when he fell hard to the floor late in the first quarter. He scored only two points over the final three periods. Time will heal some of those wounds, and the Celtics have a decent amount of time to sit back, enjoy Game 6 of the Western Conference finals from their sofas, then do it again two nights later if Phoenix can force a Game 7 against the Lakers. They made their wishes known with their "Beat L.A." chant, and the folks here in Beantown will take great pride in noting that if the two teams meet in the finals for the 10th time, the Celtics will be entering with a 7-2 record against the Lakers in the final round. The most recent of those victories came two years ago after Celtics president Danny Ainge rebuilt the team in a single offseason, adding Garnett and Allen to form the Big Three with Pierce. Well, there is now no questioning that the Big Three has morphed into the Big Four because of Rondo. And there is no doubt that a genuine quality team will be representing the East. The Cavs learned it, and now the Magic have learned it, too. "Those guys played the whole series like they wanted to win the championship," Dwight Howard conceded. "That's why they're in the position they're in now." ESPN.com writers and TrueHoop Network bloggers chatted with fans and gave their in-game opinions throughout Friday's game -- all in Daily Dime Live. Nate was great, sparking the Celtics with 13 second-quarter points as they took control. For someone who spent a season on the pine with two teams, it was actually his second-best game off the bench against Orlando this season. Not a lot of production from Lewis, a key cog for the Magic; he missed all four 3-point attempts en route to seven points. The career 39.2 percent 3-point shooter made 4-for-23 (17.4 percent) beyond the arc this series. "That's really growing up, really growing into a man tonight." • See Friday's daily leaders. 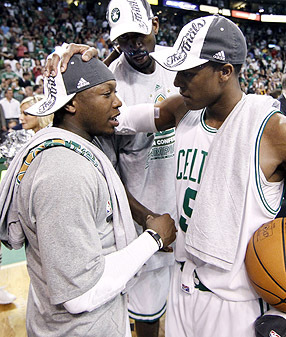 Celtics backup point guard Nate Robinson, left, is congratulated by Rajon Rondo, right, and forward Kevin Garnett, rear. Where to from here for the Magic? Well, for starters, there won't be Cleveland-style recriminations after this one. Orlando has won 59 games in consecutive seasons and been to the Finals with its Dwight Howard/Jameer Nelson/Rashard Lewis nucleus, and the Magic didn't pack it in during this series even when they trailed 3-0. However, it's hard to imagine the Magic coming back fully intact, either. The DeVos family didn't agree to shell out more than $12 million in luxury tax so they could lose in the Eastern Conference finals. While the Magic have a gleaming new arena coming online next year that should help revenues, this is still a small-market team trying to keep up with the big boys. To that extent, the nearly $10 million in salary they paid Marcin Gortat and Brandon Bass has to be a disappointment. Gortat played sparingly as Howard's backup, while Bass saw only spot duty in the Boston series after being relegated to the end of the bench for much of the season. Those two are obvious trade chips for Orlando this summer. As for what to acquire? I think the weakness with Orlando is obvious, and it's what the Celtics and Lakers showed in last year's playoffs and what Boston has shown again this year -- when the opponent has a player who can single-cover Dwight Howard, the rest of Orlando's offense sinks in the muck. What the Magic need is a perimeter player who can be a go-to offensive force in his own right. They thought they were getting that type of player in Vince Carter, but he came about two years too late. In a series where the Celtics single-covered Howard and stuck to Orlando's shooters, it was incumbent on Carter (and to an equal extent, Jameer Nelson), to break down the Boston defense. By and large, they failed. The Magic have other decisions to make that could add to next year's tax hit, most notably on restricted free agent J.J. Redick -- who seems likely to get a midlevel exception offer after a strong postseason -- and starting small forward Matt Barnes, who is likely to opt out and seek a raise from this year's $1.6 million. They also need a backup point guard since both Jason Williams and Anthony Johnson are free agents. Nonetheless, the big-picture question remains the same: Can the Magic add a player to take the pressure off Howard against opponents like Boston and L.A. that can match his size? They tried this year with Carter and failed; one wonders if they'll spend more to take another dip in the talent pool this summer.